I am probably going to be the only person in the entire universe of people who've read this book who wasn't overwhelmed. 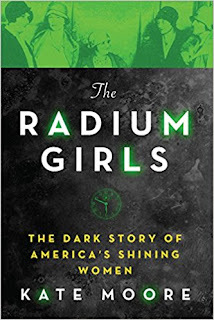 The reader reviews of Radium Girls are, if you'll pardon the pun, simply glowing, but while I think the author's intentions were great, and the story definitely compelling, my picky reading self had some serious issues with the way this book was written. The first I'd heard of the "Radium Girls" was while reading the excellent book by Deborah Blum called The Poisoner's Handbook; I remember being absolutely captivated by the story she told of a New Jersey physician, Dr. Harrison Martland (also the Chief Medical Examiner for Essex County) who in 1928 had sent the bones of a young woman to the New York City Medical Examiner. These bones were all that was left of a once healthy person who had the misfortune of taking a job at the US Radium Corporation (USRC) in Orange, NJ, where she, along with several other young women had been hired to paint the numbers on luminous wristwatches and clocks. The method they used to apply the paint was to put the brush into their mouths to bring the tip to a perfect point, dip it into the paint, put the brush into water, and then the process would be repeated. They even played around with it, putting the luminous liquid into their hair, rubbing it on their teeth, etc. 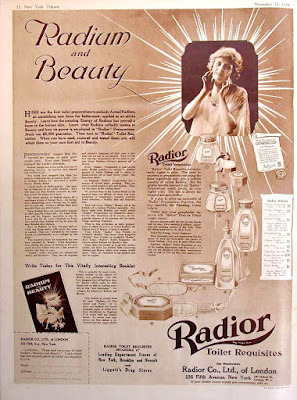 Even though the paint was made of radium, no one seemed too worried, since at the time it was considered to be great for your health -- people were enjoying radium spa treatments, it was put into toothpaste, skin products, drinking water, cigarettes, and many other items -- so there was absolutely no thought given to negative side effects. But the girls started to become very ill with a rather mysterious and incurable illness; eventually nine of these girls died by 1924. The bones sent to the NYC Medical Examiner's office in 1928 belonged to Amelia Maggia, who'd worked at the USRC for four years and died in 1923; Martland wanted the bones tested for radioactivity. "illuminate the inspiring young women exposed to the 'wonder' substance of radium and their strength in the face of almost impossible circumstances." Starting her story in 1917, she brings a human face to these women who were betrayed not only by their bosses, but also by the governments, the courts, and other individuals who continued to deny the lethal effects of radium as these women were slowly dying. In that sense, without a doubt, Moore's book is successful. She also brings to light several examples of corporate insensibility, especially toward women, and I counted a number of points she made that as of a century later continue to exist. Reading this book made me angry; it also makes for compelling reading and is steeped in tragedy. I should have loved it, and maybe I would have if it hadn't been for the writing. I am one of those very strange people who looks past the story being told down to how it's being told, and it is here where I had several issues. First, there are a number of places where we read things like "perhaps," or "She could have meant," or "there might have been" -- in short what we're getting here is a lot of conjecture. Then come the literary touches the author puts into this work, for example, on page 107 when she talks about "a troubled look" that "crossed" the face of Arthur Roeder, the president of USRC (how does she know that?) , or how "the Lord works in mysterious ways," heading a section that could have just as easily been left out with no detriment to the point she was making, or using phrases such as "The light of justice flooded in..." This sort of thing crops up again and again, and I find it particularly annoying. We also find ourselves reading things like "by all reports" in which there are no reports cited in the endnotes. There's a particularly egregious error on page 292, in which the phrase "results that showed...", citing a statistic appears, but when I went to look for the citation, there was none; on page 364 she notes in speaking about a particular dying woman that she "lost approximately one pint of blood every time..." and guess what? No citation. No source, no nothing. Seriously, while some people might think that because the author describes herself as a non-academic, scholarship standards shouldn't matter, but that's just not the case. What I object to the most is the purposeful, purely emotional tugging this author engages in. To put a human face on these women by talking about the horrors they endured is one thing (and she does it very well), but, as just one example, when you spend two pages describing the clothes people wore at a funeral, or the ribbon in a little girl's hair, and the prayers said by this little girl after her mother had died, well, that's just a bit much and unnecessary. We already by this point have an abundance of sympathy toward this woman and the costs of her illness to her family in human and monetary terms, so why belabor the point? And then, of course, there is the constant repetition of the symptoms of the radium poisoning that manifested in different ways -- she spares nothing and goes into overkill in describing every little bit of oozing pus and blood from a number of the women she's studying here. As I said, the author is highly successful in bringing their stories out of obscurity and into the light, in showing her readers that these women were human beings with families as well as victims of an industry that tragically turned its back on them when they needed help the most. So the bottom line is that while I ended up being caught up in the story of the women she profiles, became incensed that they suffered so needlessly and were refused help, became irate over the fact that some of the very same practices in the corporate universe of the time continue to exist, the truth is that I just can't overlook the writing here. 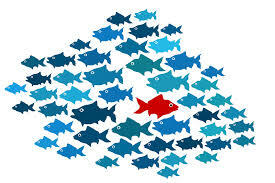 On the other hand, readers are LOVING this book, so once again, I seem to be that little fish swimming against the tide. 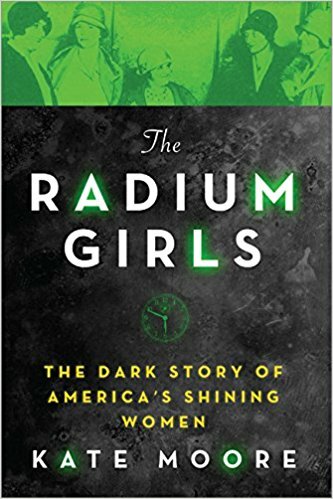 When all is said and done, I would certainly recommend Radium Girls because people should know this long-forgotten story and more importantly, these long-forgotten women in this dark episode of American history. My many thanks to the lovely people at Bloomsbury for sending me this book. Some time back I read and enjoyed this author's book A Is For Arsenic: The Poisons of Agatha Christie, in which the author had surveyed Christie's novels and short stories, and then wrote about fourteen different poisons -- arsenic through veronal -- used by Christie to kill off her victims. 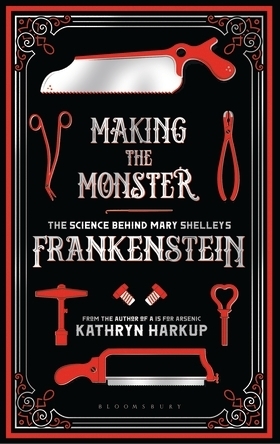 Despite the gruesome subject matter, it was a fascinating book, so when I was asked if I would like a copy of Harkup's Making the Monster, I wasn't at all going to say no. "completed a doctorate on her favorite chemicals, phosphines, and went on to further postdoctoral research before realising that talking, writing and demonstrating science appealed a bit more than hours slaving over a hot fume-hood." Thank goodness for that, because in her role as "science communicator," she is able to take some very complicated science and distill it down so that people like me can understand it. I love science but I will admit to being mystified by it at times; here I didn't feel overwhelmed or over my head. "How did a teenager create a work of fiction that has enthralled, inspired and terrified for two centuries?" which, if you consider it, is a very good question indeed, one providing the framework for what comes next. After a section on a brief look at the Enlightenment, the author takes us not only into Mary Shelley's life (family, education, contemporaries, her possible inspirations for her work, its creation at the Villa Diodati and the scandals! that followed her and her family), but into the novel itself, both the 1818 edition and the later, revised 1831 edition. 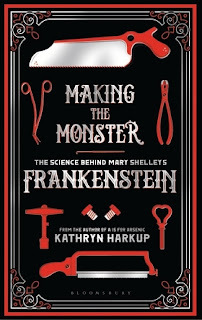 All of that makes for fascinating reading, but where this book actually shines is in following Victor Frankenstein as he makes progress in his creation. 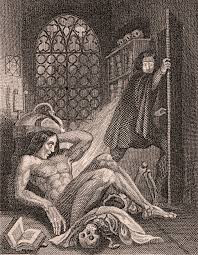 This part is just plain genius, since alongside Victor in the fictional world, we are taken through the history of science up to that time step by step, as the author demonstrates what information was available to a young woman with a well-rounded education and sheds light on the work of scholars or other people who may have influenced Mary Shelley in her writing. She also reveals how Victor's work may have followed or diverted from known science of the time. We are guided through Victor's work first in collecting the "raw materials" aka body parts, and this leads to a brief discussion of the history of the study of anatomy and discoveries that were made through the process, while taking us into the world of "bodysnatchers, resurrectionists or the "sack-em-up men," which could often, as the author noted, provide a good living. Using this model (the fiction vs. the real science) she goes on to examine the question of how Victor would have been able to preserve what he'd collected against the history/practices of real-world counterparts, going on into how Victor constructed his creation. She then turns to the "small electrical machine" he built to provide the spark of life to his creature, and then it's on to the reanimation of his finished creation, which leads to some of the most interesting writing in this book as she goes into the history of electricity and experimentation in its potential uses in medicine, some of it just plain creepy. Following this section is another excellent (albeit short) chapter that focuses on the mind of creature itself, and the moral implications of its creation; there is also a timeline in the back that is quite interesting and extremely useful. Once I started Making the Monster it was a book I was reluctant to put down for any reason, which says a lot since "scientifically-minded" is not a description I'd use in describing myself. However, as I said earlier, the way in which the author put this book together made the science completely accessible so that the information is not at all overwhelming. It is also a timely release, since it is now two hundred years since the publication of the original edition of Mary Shelley's Frankenstein, which as a novel has continuously captured people's imagination over the centuries. Anyone at all who has read Shelley's book will love this one which gets behind the science fiction into the science fact. 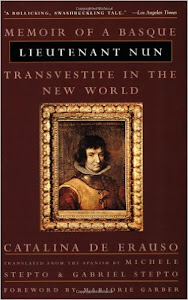 highly recommended -- and again, my many, many thanks to the powers that be at Bloomsbury.